Jess Adalida (#4) and Capital Ice (#9) qualifying for the Dash For Cash Futurity(G2) from the third trial at Lone Star Park Saturday. GRAND PRAIRIE, TX�SEPTEMBER 16, 2017�The weather was clear and the track was fast for the hopeful contenders in 11 trials vying for a place in the Grade 2, $393,000 Dash for Cash Futurity Final to be run Saturday, September 30 at Lone Star Park. Capital Ice, a son of multiple stakes sire IVORY JAMES garnered the final qualifying spot on Saturday night following a close finish in the third trial to Jess Adalida. 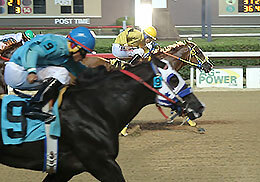 Coming off a third-place effort in the Grade 2 Firecracker Futurity in July, Capital Ice clocked a :20.124 time into an11 mph headwind under jockey Jose Martinez. Angel Sanchez conditions the bay gelding for owner Jody Gracia. Bred in Texas by Womack and Cavender Farms, Capital Ice is out of the Mr Eye Opener mare Fantastic Six. Also, fourth in the Grade 2 Sam Houston Futurity, he has compiled a (5) 1-2-1 record and banked more than $70,400 this season. For the official list of qualifiers for the 2017 Grade 2, Dash for Cash Futurity, including times, sires, dams, owners, breeders, trainers and jockeys CLICK HERE. All participants in the trials tonight that did not qualify for the final remain eligible for the Dash for Cash Juvenile Stakes on Saturday, September 30. Preference will be given to the horses based on their times in the trials. For a list of the second 10 fastest qualifiers from tonight's trials CLICK HERE.